Colin Wright, FIA Hon. 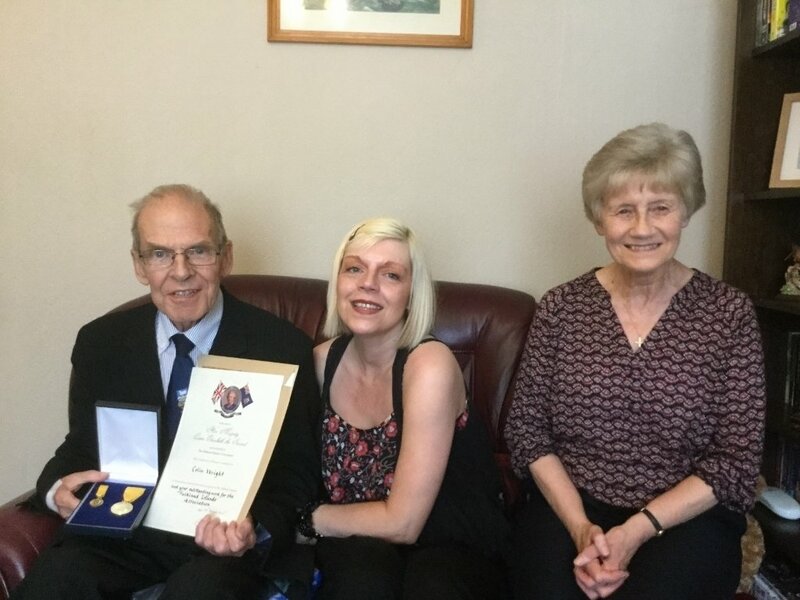 Secretary, was presented with the Queen's Certificate and Badge of Honour at a small ceremony at his home in Shrewsbury on Monday, 31 August 2015. The presentation was attended by his wife and daughter (and her partner) and by the vicar of St George's church who has ministered to Colin throughout his illness. Former Governor and FIA Chairman, Alan Huckle, was given special permission to present the award on behalf of the current Governor, HE Colin Roberts, since Colin was not strong enough to travel to London. With his typical modesty, Colin said that the award was as much an acknowledgement of the work of the Association in support of the Falkland Islanders' right to self-determination as it was a tribute to his own contribution to it. But he was clearly very proud - and grateful - that his role had been recognised by the Falkland Islands Government.